I met my first Florida black bear up close in 2006 while photographing a cattle ranch in Highlands County near Archbold Biological Station, halfway between Lake Placid and Palmdale. A biologist named Joe Guthrie was catching bears and using GPS collars to study their movements. I knew Florida had bears in big protected areas like Ocala National Forest and Big Cypress National Preserve, but I did not know about the smaller bear populations in between, such as those in Highlands and Glades counties that survived on private ranchlands. Photography by Carlton Ward Jr.
Guthrie’s GPS collars revealed the statewide importance of this little-known bear population and the lands they inhabit. 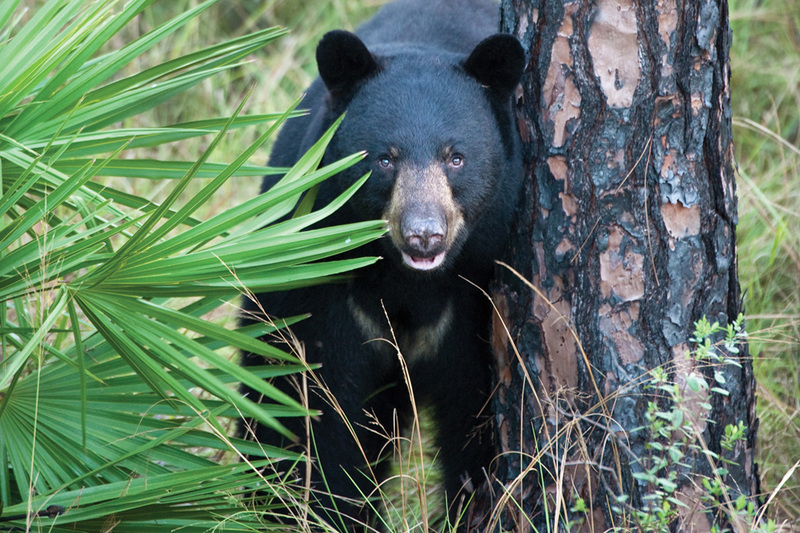 Black bears once thrived coast to coast throughout Florida. But as the human population has grown, bears have been squeezed into inland forests. An unintended consequence of our buildings and roads has been the breaking apart of their natural habitat into shrinking and increasingly disconnected fragments. The black bear can show us how to save wild Florida. These bears live in seven distinct subpopulations, whose homes range from Panhandle pine forests to the cypress swamps of the Everglades. If we protect wildlife corridors, the land needed to keep Florida’s seven bear populations connected, we will ultimately save the green infrastructure needed to sustain the health of other wildlife species and ourselves. The bears inspired a group of conservationists, including me, to found the Florida Wildlife Corridor campaign. We then followed in the footsteps of black bears for two 1,000-mile expeditions to show that the statewide Florida Wildlife Corridor still exists and can be saved. I named the bear pictured here, “Iron Hide.” When I captured this frame in December 2009, I had been working dawn to dusk from a tree stand on a Highlands County ranch. Guthrie came by one morning with his dart rifle and placed a perfect shot to a bear’s rear haunches from 15 yards away. Somehow, the dart bounced off. This large male bear, with his distinctive chest blaze, evaded being collared but appeared the next day in front of my camera trap. Another bear Guthrie collared that month ended up going on a 500-mile walk the following summer, connecting the outskirts of Orlando to the edges of Fort Myers and just about everywhere in between: cattle ranch, orange grove, tree farm, bombing range, state park, national wildlife refuge—different zones, but all connected common ground. Hopefully, the story of the bear can help us keep it that way.